Last summer marked the bicentenary of the legendary Battle of Waterloo, one of the greatest and most famous battles in British history. 2016 has seen a resurgence in public debate and discussion over the current ideas of ‘Englishness’ and British national identity surfacing in the build up to this June’s Europe referendum. In the portrayals and remembrances of one of Britain’s greatest military heroes and perhaps her ‘last great Englishman’, the Duke of Wellington, we find an unrivalled case study of the changes in ‘Englishness’ and our evolving national identity. The image portrayed of the 1st Duke of Wellington, Sir Arthur Wellesley, in current modern memory is one of heavily polarised viewpoints, or that of decay in memory entirely. The portrayals and depictions of Wellington that have survived into the present are, as our research questionnaire has indicated below, both few and heavily weighted to the depiction of a heroic military image of the ‘great English aristocrat’, both positively and critically. 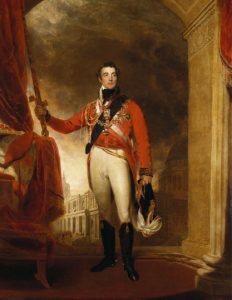 The views of the Duke to be seen today, or even more appropriately the degree to which he has been forgotten, are due largely to the decay of memory in a different, modern Britain with different priorities and identities of hero status, and also as remnant of the active image-creation that went about during and after Wellington’s life. Research showed that the Duke of Wellington as a figure today is unknown or unfamiliar, and so it is safe to assume that the image and memory that still remains of Wellington is only the remnants of the strongest and most lasting portrayals. The lasting portrayal of the Duke does not necessarily paint an accurate or rounded picture of his life and career, but rather represents what meaning was put behind the image of the ‘Iron Duke’ as an effort of legacy creation around and prior to the time of his death. Even the negative elements and criticisms of the modern image remaining of the Duke manage to exclude the less popular periods of his career as a public figure, with a majority of questionnaire respondents knowing little of his political history as a parliamentarian and controversial Prime Minister. Instead critics of the heroic image of Wellington reflected his positive portrayal of 1852 onwards as being no longer relevant to Britain today, unjustly glorifying warfare or one man’s acts in an out of date, Imperial world. Historian Rory Muir, a noted biographer of Wellington, further adds to this, thinking to downplay the older negative images which focused on emphasising the Duke’s political failings and controversy of contemporary opinion for a more modern image less distorted by that part of his legacy. He further helps boost the overshadowing portrayal of the Duke as the Heroic military figure and emblem of ‘Englishness’ and national patriotic pride, though perhaps one belonging to a past era of British identity. Ultimately, credit must be given to the efforts of image creation which have so dominated the last portrayals of Wellington from before and after his death, widely forgetting his political life for the preferred depiction of this ‘last great Englishman’, regardless of the incomplete nature of the image that has left behind. The aims of the questionnaire were to gain a better understanding of the legacy of the Duke of Wellington’s image and which of his portrayals have lasted in modern memory. Studying the decline and perseverance of certain portrayals and what images have been chosen to be remembered in contrast to which elements of the Duke’s memory have been forgotten, wider conclusions can be drawn in terms of how this reflects modern attitudes towards hero worship and depictions of ‘Englishness’. While Wellington’s status as British military commander was a point of his contemporaneous mass celebrity status, only a small fraction of people (11%) of people we surveyed had knowledge of the present Head of the Army, including several that stated The Queen. This seems to emphasise the trend indicated of modern veneration diverting away from patriotic figures. It is noticeable throughout the responses given to the questionnaire that there was a significantly recurring pattern of comments stressing the need for an awareness and knowledge of British history and the important figures, such as Wellington, that shape it, but there was a lesser focus on commemoration and celebration. One participant stated that he was “On the fence, as [Wellington] was significant to Britain as a hero but is less relevant to current day Britain”, reflecting a mind-set widely shared across the questionnaire’s results. Another participant (interestingly, an ex-service member), said that Wellington was “part of a bygone era” and that we should “celebrate recent heroic act” as oppose to those of times gone by. The overarching results of the questionnaire tend to demonstrate the modern image of Wellington as having considerably faded from popular memory, with little over half of the participants (53%) either having no knowledge of Wellington or being uncertain on his status in British history. The reputation that does seem to have remained, however, is distinctly representative of the heroic image of a military figure created during The Duke’s life and immediately after his death. In this, there is very little awareness of his political career, with nearly two thirds of participants (65%) stating uncertainty or ignorance of his period as Prime Minister, and a further 60% being unaware of his parliamentary status. It might seem safe to assume that the traditional idea of ‘Englishness’ would always be relevant in England, but it seems that the very concept of ‘Englishness’, what it means to be English and what codes an Englishman should follow, has changed dramatically since Wellington’s era. Indeed, as previously mentioned, Tennyson’s image of ‘The last great Englishman’. 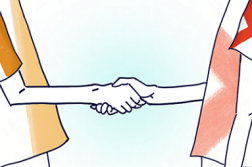 The ideals that created this concept has shifted from a more inward idea of nationalism to an internationalist viewpoint of integration and tolerance. The idea of nationalism has lost the patriotism that it once had, with multiculturalism opening the doors to a wide array of cultures that have an important influence on our society. So, as the embodiment of Englishness, Wellington has lost relevance to our modern society. Following his death, as the historian Peter Sinnema has pointed out in his years of research, there was a conscious effort to present the Duke as the embodiment of Englishness. He was encouraged to be revered by the British public as an upholder of its value, and that people should model their morals and values around him. But this is simply not the case today, and such a depiction cannot hold up to modern values. Indeed, one participant in the questionnaire stated that “Whilst his achievements were impressive in the context of the world in which he lived I am not sure about how much he stands up to modern moral scrutiny.” This is particularly interesting as, in Britain’s imperialistic era, its values were wholly divergent from today – the emphasis was on control and fear of the other. 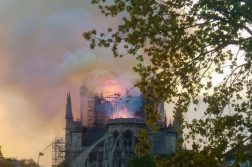 However, in today’s globally connected world, this cannot be adapted and as such the Duke cannot be remembered in this light. The idea of military conflict being commemorated at all is also debatable in a modern context. One participant, in response to whether or not they could name any British military heroes, said that “Do such things exist? I’m not sure military conflict should be seen as heroic”. Again, what is interesting is that the very idea of a military hero is up for debate. Perhaps it is not Wellington that has been forgotten, but rather the idea of a English military hero itself. It is important to consider that modern art itself has changed both in it application and in its perception. As is often the case with most forms of individual expression, art can be seen as a reflection of the cultural realities in which it is produced. In the case of Wellington, he was more often than not portrayed in art in a rather heroic light. Such depictions are vast in number, but one in particular may spring to mind. 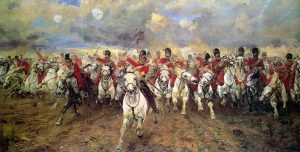 Lady Butler’s ‘Scotland Forever!’ is hero worship in all its glory – showing the start 0f the charge of the Royal Scots Greys, a British cavalry regiment that charged alongside the British heavy cavalry at the Battle of Waterloo in 1815. It is clear that in 1991, when the painting was produced, the idea of a hero was a very traditional one – a military champion and the embodiment of valour. 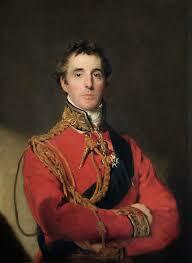 As Commander of the British Army, Wellington was seen as the antipathy of this. But, how relevant is this today, and what can this tell us about the relevance of the Duke himself and whether or not his contemporary image has lasted? One interesting modern comparison with the art forms of Wellington’s era is Reuben Dangoor’s ‘Trapstar x Logan Sama’. 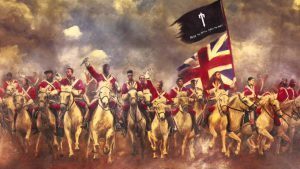 The artist has taken ‘Scotland Forever!’ and given it a 21st century twist, replacing the Royal Scots Greys with a number of leading MCs belonging to the musical genre of Grime. Their swords have been replaced by microphones, the eagle flag replaced by the clothing brand Trapstar’s logo and their bearskin caps replaced, by flat peak caps or nothing at all. These are all staples in today’s youth culture and, clearly, the idea of hero is far different now to what it was some 100 years ago. For Dangoor to contrast the heroism of the people that once defended Britain from invasion to musical figureheads of today shows the extent to which the relevance of figures such as Wellington has dwindled. Today, people are influenced by individualism and freedom, and popular culture itself has changed dramatically, with art forms such as fashion, music and television taking the centre stage for many people. So, is there a place for the traditional image of heroism in today’s society? The very fact that the realities of today do not require such a military figure, suggests not. We are not confronted by the prospect of war on our own soil, and warfare to a large extent is not glorified in popular culture as it once was. On another note, we could even go as far as saying that such military heroism has become so irrelevant that it can be – and is – mocked. 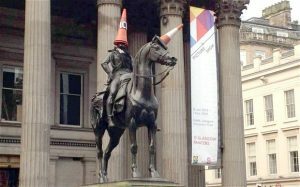 Indeed, the Duke of Wellington statue in front of the Gallery of Modern Art in Royal Exchange Square, Glasgow, Scotland is subject to ridicule. The statue can often be seen with a cone its head, and rarely without. In 2013 the local government attempted to raise the statue’s base to stop such vandalism, a 10,000 name petition was produced and plans were scrapped. Is such a blatant disregard for the Duke’s legacy a lack of respect, knowledge or relevance? It could be all three. But the fact remains that there seems to be a clear barrier between today’s society, and in particular is younger generation, and the foundations that laid it. Wellington is no longer a relatable figure, and despite commemorations that have lasted the ages, there seems to be a genuine incompatibility with today’s society and the Duke of Wellington’s legacy, causing it to be forgotten.